Earlier this month, I was fortunate to embark upon my own, mini vision quest wandering around County Donegal, Ireland. The four day trek started at Horn Head, in the north of County Donegal, Ireland. Reaching Horn Head is about an hour from Letterkenny and can be reached on the N56 heading to Dunfanaghy. Go through Main street following the signs to Horn Head and after crossing the bridge, look for a gravel road and head left. The car park is shortly up the gravel road and appears to hold at least a dozen vehicles although I was the only one there. From the car park, you pick up the Tramore loop. 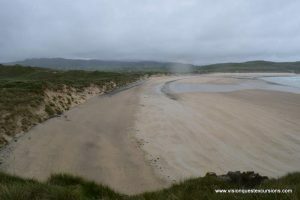 One used to be able to make a full, 16 Km loop from the car park to Horn Head, following the road back to Dunfanaghy from Flaggy Faugher to complete the loop to the car park. Unfortunately, the McSwynes Gun loop trail is closed and unless one is willing to ignore the signs and jump over the barbed wire, it will take two hikes. 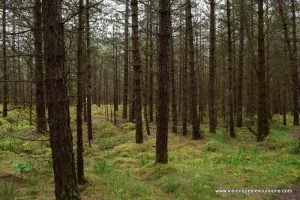 The trail quickly enters a forest of pines, probably an old pine plantation. The moss is interesting here as it mounds up around the trunks of the trees like a green mulch bed. Emerging from the pines, the trail becomes a mix of forest and grassy meadow. Take note of the many colorful snails along the path with the interesting spiral design on their shells. Eventually, you come to a fork where there is a small pool of trickling water and co go either left or right. I followed the path right although the loop will bring you back by way of the alternate fork so the walk is the same, albeit in reverse. Reaching the shore, you are reworded with some great vies of the sea along the cliffs, and it is here that you encounter the trail closure sign for McSwynes Gun loop. The thought crossed my mind to ho the fence and head towards the marble arch, but I decided against it not knowing the reason for the closure. It could have been safety, or the rights of a private property owner, so I thought it best to respect the posting. Head back along the beach and enjoy some more marvelous views of the sea and the sand dunes. Had the day not been a bit overcast, it would have been tempting to linger and pick up some sun before heading on. Lingering is definitely a possibility, and the area makes a tranquil spot for a picnic or just a day on the beach. Arriving back at the car park, head back to the road and follow the posted signs to Horn Head, where you will reach a car park. Plan to spend some time here and enjoy the boggy landscape, diverse wildlife and birds, and even hike on to the marble arch. Depending on how long you wish to stay, plan about 4-5 hours to enjoy the area at a leisurely pace or make an entire day trip out of it. For a guided tour visiting Horn Head and nearby Malin head, the team at Ancient Ireland Tourism will go here and customize an excursion for you.